Temple view is a delightful family hotel, highly praised for food service and comfort, welcoming all ages. Come to one of the most unique and distinctive of the Outer Islands, to relax and enjoy what many seasoned travellers consider to be magical in its atmosphere. Temple View was built as a family home in 1900, became a guest house in the thirties, and has recently been tastefully extended to provide a delightful hotel of quality. In extending Temple View we have put great emphasis on providing a professionally run establishment with high quality fixtures and fittings. We have ten spacious well-appointed letting bedrooms each with bath and shower en-suite facilities. There are four single and six double/twin rooms including one with disabled facilities. All rooms have tea and coffee making facilities, direct dial telephone, hairdryer and colour television. There is a choice of dinner in the dining room or a meal in the informal lounge diner. We specialise in local produce whenever possible. Both menus represent excellent value and are complemented by a carefully chosen wine list. The sun lounge provides an ideal retreat after dinner where you can enjoy the sunset over the sea lochs and the Temple. 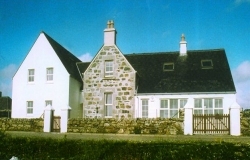 The rooms to the front have extensive views of small islands towards the large tidal island of Baleshare, and the 13th Century ruin of Trinity Temple, from which the Hotel gets its name. The rooms to the rear have views of moorland and distant hills towards the east of the island.